Cold Case Detective, Ronan O’Mara, is looking forward to starting a new life in his new home, but when a strange house warming gift appears on his doorstep, he has no idea that it marks the start of a series of events that will put his life, and the lives of everyone close to him in danger. When murders similar to those committed by dead serial killer, Rod Jacobson, start occurring around Boston, Ronan is certain he has a copycat killer on his hands. Psychic, Tennyson Grimm, is approached by friends for help dealing with issues surrounding their son. He quickly realizes there is more going with the boy than teenaged angst. Though he doesn’t want to believe it, his psychic abilities and a series of strange paranormal occurrences point to a link between the troubled teen and the murder victims that are turning up all over Boston. When Ronan is attacked during the investigation, it’s up to Tennyson and Captain Fitzgibbon to find the killer without him. Will they be able to stop the murderer before the evil that surrounds him destroys them all? 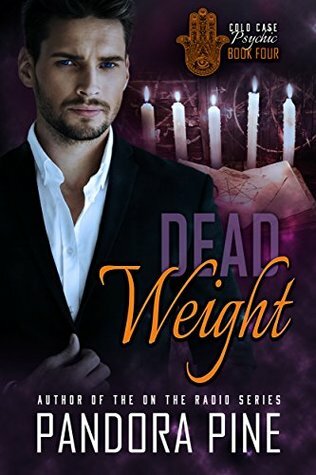 Dead Weights is the fourth book of the Cold Case Psychic series. Tennyson and Ronan are newly engaged and start their new life together by moving into their new house. Everything is going great for them. Tennyson has his powers back, Ronan and he are more in tune and in love more than ever, and they don’t have a traumatic case…for now. But nothing can stay like that, and Tennyson has gotten new visions of murders, young men murders, like with the Rob Jacobson case, but it can’t be him, since he’s dead. So who’s impersonating this serial killer? This book is, in my opinion, the one that gives me the most feelings. Tennyson and Ronan are my guys, and I loved to see them having their happy life, in their new house next to Carson and Truman. It was good, like being on vacation, after all the ups and downs we read in the 3 previous books. But of course, the author couldn’t let us be happy and in peace, nooooo, she had to make us suffer, a little bit. That’s when everything went to hell at least for me. The case is very specific, and what we’re used to reading about the crimes and the hunt for the killer is different in this book. It was a risk, and so far, it was a good risk. This book is more cryptic I’ll say, with a little bit of religion, but it was coherent with this particular case and killer. I almost had a heart attack in the middle of the book, there’s a twist that I didn’t see coming, and it put my blood pressure very high. I can say that I was on a rollercoaster of emotions. But the end, kind of ruined the book for me. I don’t want to spoil the book, but I’ll try to explain it. The final scene, just before the epilogue, bothered me. In my opinion, the scene wasn’t well written, and the author missed something in it. It wasn’t that the scene doesn’t make sense, because, in this tricky situation, with this particular character, I understand why the author does that, I’m okay with the motivation, I’m not okay with how it was done. It was like everyone abandoned this character and gave him the green light, like an encouragement. It really bothered me, and kind of ruined the book for me. It pissed me off a little bit because right after this scene, the epilogue comes…and it was a beautiful epilogue (I was totally crushed, crying like a baby with big fat tears), with a lot of answers and explanations. That’s why I think this last scene wasn’t well written because maybe, if I had some of explanations that were in the epilogue in this scene, it would have given me another feeling. That’s why I put 3 OptimuMMs for this book. But don’t get me wrong, I’ll keep reading this series, I still love it a lot, and it’s not because this book leaves me with a bittersweet aftertaste that I don’t want to follow the series anymore. That’s what happens with a series, we all have a favorite and less favorite. This is one is my less favorite.